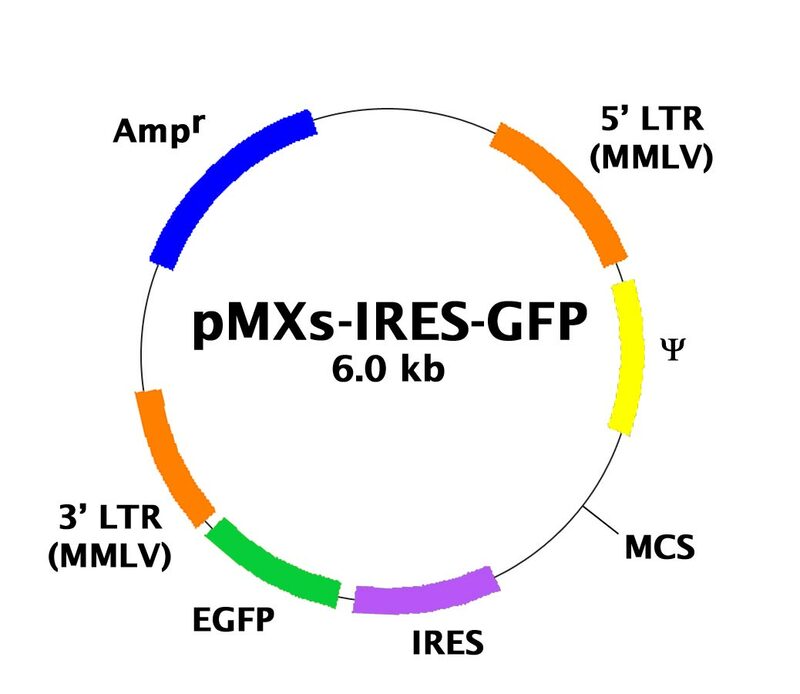 pMXs-IRES-GFP Retroviral Expression Vector | Cell Biolabs, Inc.
Mueller, A.A. et al. (2016). Intronic polyadenylation of PDGFa in resident stem cells attenuates muscle fibrosis. Nature 540:276-279. Baek, J.M. et al. (2016). Nicotinamide phosphoribosyltransferase inhibits receptor activator of nuclear factor-kB ligand-induced osteoclast differentiation in vitro. Mol. Med. Rep. doi:10.3892/mmr.2016.6069. Chiu, Y-H. et al. (2016). Dendritic cell-specific transmembrane protein (DC-STAMP) regulates osteoclast differentiation via the Ca2+/NFATc1 axis. J. Cellular Physiol. 10.1002/jcp.25638. Kimura, T. et al. (2016). Polarization of M2 macrophages requires Lamtor1 that integrates cytokine and amino acid signals. Nature Comm. doi:10.1038/ncomms13130. Werner, S. et al. (2015). Iroquois homeobox 2 suppresses cellular motility and chemokine expression in breast cancer cells. BMC Cancer. 15:896. Ravikumar, P. et al. (2015). Nanoparticle facilitated inhalational delivery of erythropoietin receptor cDNA protects against hyperoxic lung injury. Nanomedicine. doi:10.1016/j.nano.2015.10.004. Amagai, Y. et al. (2015). A point mutation in the extracellular domain of KIT promotes tumorigenesis of mast cells via ligand-independent auto-dimerization. Sci Rep. 5:9775. Sakata-Yanagimoto, M. & Chiba, S. (2015). Notch2 signaling in mast cell development and distribution in the intestine. Methods Mol Biol. 1220:79-89. Shapiro, I.M. et al. (2014). Merlin Deficiency Predicts FAK Inhibitor Sensitivity: A Synthetic Lethal Relationship. Sci Transl Med. 237:237ra68. Zhang, Q. et al. (2013). TNF-α Impairs Differentiation and Function of TGF-β-Induced Treg Cells in Autoimmune Diseases through Akt and Smad3 Signaling Pathway.J Mol Cell Biol. 10.1093/jmcb/mjs063. Koso, H. et al. (2012). PNAS Plus: Transposon Mutagenesis Identifies Genes that Transform Neural Stem Cells into Glioma-Initiating Cells. PNAS. 10.1073/pnas.1215899109. Guan, Y. et al. (2010). Human TLRs 10 and 1 share common mechanisms of innate immune sensing but not signaling. J. Immunol. 184:5094-5103. Cui, G. et al. (2009). Berberine differentially modulates the activities of ERK, p38 MAPK, and JNK to suppress Th17 and Th1 T cell differentiation in Type 1 diabetic mice. J. Biol. Chem. 284:28420-28429.